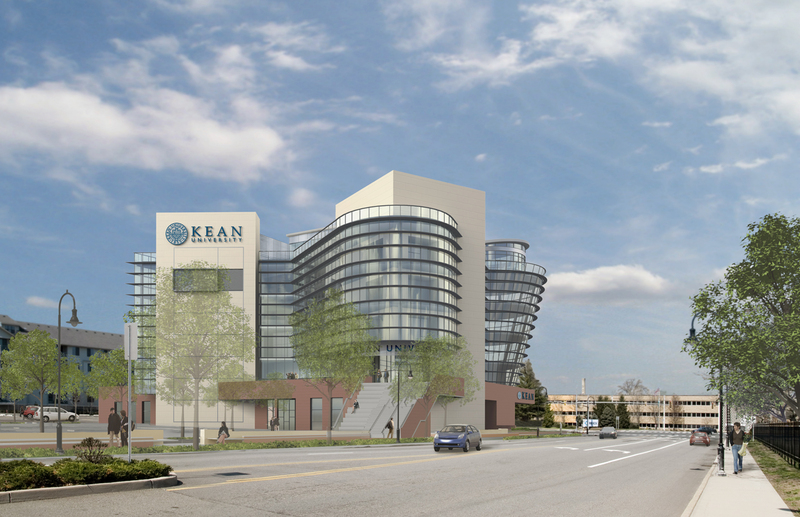 Gruskin Group™, one of the nation’s leading design firms, has been awarded the project to design a new, mixed-use building for Kean University in Union, NJ. The proposed 102,275-square-foot building will serve as a gateway marking the main entrance to Kean’s campus located at the intersection of Morris Avenue and Green Lane. The six-story building, which is intended to provide both a stimulating and metaphorical environment for learning, includes a café and retail space on the first floor, classroom and administration space on floors two through five, and a conference center and rooftop terrace on the sixth floor. 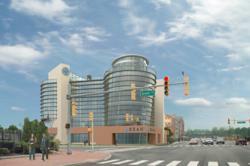 The building will serve as the home for Kean’s new Robert Busch School of Design, as well as the University’s expanding business programs. “Our objective for this new building is to make a bold architectural statement and announce to visitors and the general public that they are about to experience something unique upon entering the campus. At the same time, the building design must establish the tone and quality of what can be expected beyond its demarcation as the University’s primary entry portal,” explained Kenneth A. Gruskin, principal and founder of Gruskin Group. Among the building’s most distinctive and modern design elements is its undulating glass building façade which stands in contrast to three opaque towers that not only serve a practical function, but also align with the three local geometries that define Kean’s campus. For example, Gruskin Group designed the towers to house elevators, fire stairs, and bathrooms. In addition, the tower along Morris Avenue aligns with the grid that defines the primary road systems and the original Kean structures. The second tower defines the academic building’s main entrance and follows the geometry of the main Kean University campus. The third tower’s vertical plane faces the University’s athletic fields and facilities. “By responding to the local framework of the campus and city, the building is able to serve not only as a gateway building, but also as a critical part of the larger whole,” noted Gruskin. As an architectural acknowledgement at the Morris/Green Lane intersection, the building features an outward slope that leans toward the entrance corner. It is topped by a circular conference center space, which offers dramatic views of the campus and New York City, and is suitable for small conferences and community events. The roof terrace will also be accessible to students and guests to meet and pass time between classes, events, and meetings. A halo-lit Kean University seal floats beneath the canted roof of the conference center space, visible to the street corner below. The building’s rectangular first floor is finished in brick that acts as a base and provides architectural contrast to the modern metal and glass upper floors. A repeating series of horizontal metal solar shading fins define the outer edge of the façade curtain wall, enhancing the visual impact of the building’s non-orthogonal geometry. The exterior skin is designed to facilitate a connection between the building occupants inside and the community outside that is afforded a unique glimpse into the academic classrooms from the outside. A promenade located along Morris Avenue that connects the main campus to the Green Lane academic entrance will feature seasonal planters amidst a series of benches and seating opportunities which will offer people the opportunity to meet and relax. The promenade leads to a grand exterior stair that sweeps students up to a second story entrance that serves the academic levels of the building. Designed into this grand entrance stair is a bleacher section that offers a southern exposure where students can sit and gather in the sun. The School of Design will be set in in an open plan environment to foster an atmosphere of collaboration, integration and adaptability. Named among the nation’s top 250 architecture firms by Architectural Record in 2011, Gruskin Group has also been ranked by DDi magazine as one of the top 20 retail design firms in the U.S. for the past three years, and included in Commercial Construction Magazine’s 2010 and 2011 lists of Top Commercial Architects. In addition, Gruskin Group was named to the Inc. 5000 in 2009 and 2010. The firm’s and its professionals’ award-winning work has been recognized by AIA, the Retail Design Institute, New York Ad Club, New Jersey Ad Club, ASID, Graphis, and the Association of Graphic Communications. For additional information, visit http://www.gruskingroup.com.